Strengths: Size, Strength, and Physical Presence. Weaknesses: Lack of consistent scoring ability, puck handling, speed. Rupp has been an absolutely tremendous addition to the Penguins roster. He added size, edge, and surprisingly even a scoring touch to the fourth line. Prior to the 09-10 season Ruppers has never had more than 6 goals in a single season. While in the city Pittsburgh he was to able to surpass his career best in as early as 3 months of play with not only a single goal, but rather his first career hat trick. He played all but one regular season game before riding the bench through the most of the playoffs. 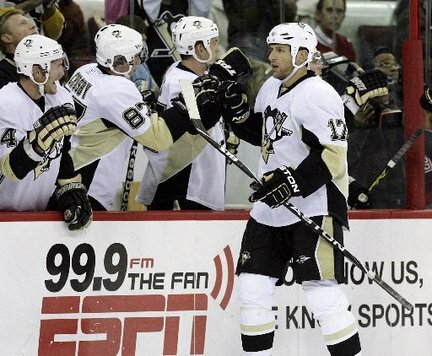 Despite that, his play throughout the year did not go unnoticed amongst Penguin fans. Shero had once again proved his genius. With Feds and Poni both likely on their way out, we expect to see Dupuis moved up a couple lines leaving room for Rupp on a more permanent basis. Such a large improvement in his stats since joining the Pens is likely to leave a mark in the minds of the coaching staff. In our opinion, the fourth line has a new permanent face. Now are there area's in Rupp's game that could improve? Sure, but none of them are necessary. He does everything he needs to do and then some. At $850K this coming season, you bet he is. Under contract through 2010-2011. Mike doesn’t appear to be the subject of trade bait this summer, that much is true. Though you never know what Shero's off season plans will include.